Hamlet's father, the king of Denmark, has died suddenly. But instead of grieving, his mother Gertrude has married the dead king's brother, Claudius. One dark night, Hamlet sees a ghost. It is his dead father, who claims he was murdered by Claudius, the new king. But did Hamlet really see a ghost, or did he just imagine it? And if he did see a ghost, was it telling him the truth? Hamlet plans to avenge his father by killing Claudius. But the man he stabs isn't Claudius, as he thinks, but his girlfriend's father. So the wrong man dies. So much tragedy, but there is more to come. Who else will die an untimely death? And who will live to tell the tale? Real Reads are accessible texts designed to support the literacy development of primary and lower secondary age children while introducing them to the riches of our international literary heritage. 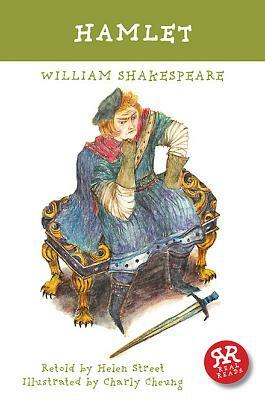 Each book is a retelling of a work of great literature from one of the world's greatest cultures, fitted into a 64-page book, making classic stories, dramas and histories available to intelligent young readers as a bridge to the full texts, to language students wanting access to other cultures, and to adult readers who are unlikely ever to read the original versions. Jeff Dolven (Editor), PhD, is Associate Professor of English at Princeton University.David Scott Kastan (Series Editor; Introduction), PhD, University of Chicago; George M. Bodman Professor of English, Yale University. He lives in New Haven, CT, and is considered one of the world's leading Shakespeare scholars.Kevin Stanton (Illustrator), Brooklyn, NY: BFA in Communications Design, Illustration, Pratt Institute; selected to participate in Pratt Show 2010, an annual juried exhibition of exceptional design, as well as in a forthcoming iam8bit art show.